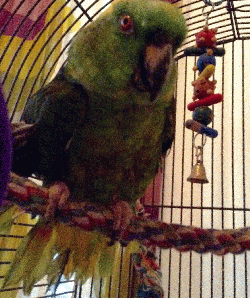 I`m a mature yellow naped amazon. When I arrived, I had a hernia for 20 years. Mickaboo arranged to have my hernia repaired and I feel so much better. My voice is very cute. I say "Hi Alberta" and "Mom!" and "Hurry up! when breakfast isn`t served quickly. I love to sing with you. Won`t you make beautiful music with me?